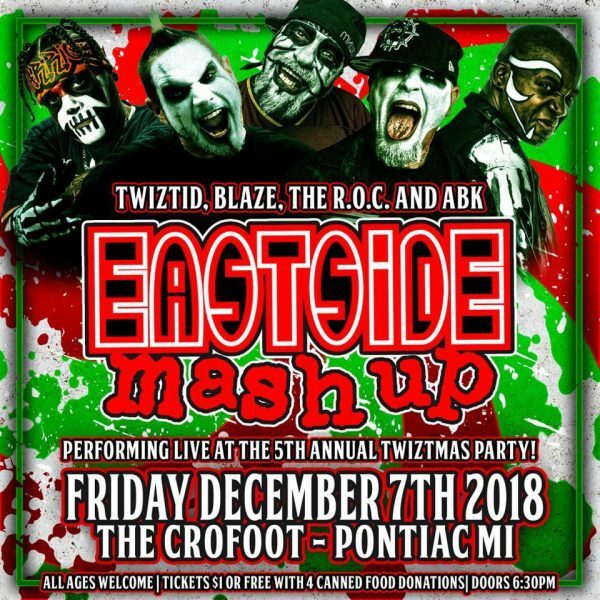 News > Underground News > Eastside Mashup Announced for Twiztmas this Friday, December 7th! Eastside Mashup Announced for Twiztmas this Friday, December 7th! The 5th annual Twiztmas Party will be taking place this Friday, December 7th at The Crofoot in Pontiac, MI! Over the past day or so, they have been hyping up something called the Eastside Mash Up who will be performing at the party. They slowly announced who would be a part of this group, starting off with Twiztid of course. Then they revealed that Blaze, The R.O.C., and even Anybody Killa will take part in this special performance! All 5 will be on stage at the same time performing what I can only guess is a grip of classic Juggalo tunes! If you’re anywhere close to Pontiac, you definitely need to be at this show! Tickets are only $1.00 each, or you can get in FREE with 4 Canned Food Donations. Not only will you see the Eastside Mashup, but you’ll also get performances from Alla Xul Elu, Young Wicked, REDD, Xtra Overdoze, Kosha Dillz, Insane E, and more! Awwwwww Papa J gonna be mad! “Classic juggalo tunes”? I thought juggalos aren’t aloud? Does that mean if you go you’re a juggalo? I dont wanna go i’ll just get kicked out. No ones ever been kicked out a Twiztid show for being a juggalo nor has anyone said so you tard. As I’ve said if Twiztid didn’t allow juggalos at their shows there would be 99.999999999999% less people at their shows lol. The over the hill mash up show ! All ten people will be excited to see them. Mars (Mad Insanity) Releases New Single “Bad Temper” Via Empire Records! Underground Alliance Spotify Playlist Launch Featuring Twiztid, Ill Bill, Necro, Madchild & Swollen Members, Slaine, Rittz, And More! David Gunn of King 810 Releases Vol. 3 EP Under His “Yavid” Solo Career; David Gunn “Summertime in Murdertown” Memoir Book Now Shipping! Tech N9ne confirms Serj Tankian of System of a Down for “Something Else” album!